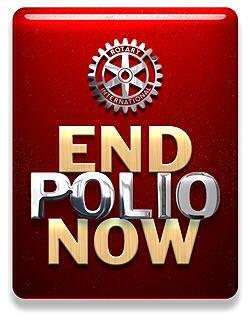 Rotary has made a commitment to eradicate polio, and Rotarians keep their word. We are this close, and getting closer every day. For each dollar contributed to this project by our Aussie Pride Badges, the Bill and Melinda Gates Foundation donate $2 to this international polio project. There has been no recorded case of polio in India for over two years now, such has been the success of this project in that country. There have been no recorded cases in Africa for over 12 months too. In 2018, there were just a few report cases of this terrible disease. The continued fight to eradicate polio gets an additional $40 million boost from Rotary in support of immunization activities and research to be carried out by the Global Polio Eradication Initiative. The funds will be used by the World Health Organization (WHO) and UNICEF for polio immunization, surveillance and research activities in ten countries, as well as to provide technical assistance to additional countries in Africa to keep the continent polio free. In 2014, the world saw significant progress against polio in most places. Nigeria – the last polio-endemic country in Africa – saw a nearly 90% reduction in cases in 2014 over 2013, with the last case recorded in 2014. In addition, more than half of the world’s polio cases in 2013 were the result of outbreaks in previously polio-free countries, largely caused by instability and conflict in countries such as Syria, Iraq and Somalia. These outbreaks appear to have been stopped in 2014 following special vaccination efforts in 11 countries, reaching more than 56 million children. The exception to this progress was Pakistan, which saw an explosive outbreak which resulted in more than 300 cases in 2014, the highest number in the country in more than a decade. As a result, Pakistan accounted for almost 90% of the world’s cases in 2014. In 2015, Pakistan has the opportunity to reverse that trend and in doing so, help the world end polio forever. Only 54 cases have been detected so far. The progress made against the disease in 2014, while significant, is fragile. Rotary’s funds have been supporting efforts to end polio in the three countries where the disease has never been stopped: $8.1 million in Nigeria; $1.1 million in Pakistan and $6.7 million in Afghanistan. 2.5 billion children have been immunized since 1988, meaning over 10 million are alive today and walking. There were around 350,000 new cases of Polio each year in 1988, but in 2015 there were only 55. We are so close to total eradication. Your purchase of these badges helps us to reach this important goal.